Quick adoption update: Fingerprint results are back for one of the nannies, so that means we are only waiting on three more documents before we are put on a waiting list. None of this will really feel real until we are on that list, so I can't wait to start waiting! We also learned that our social worker at the adoption agency doesn't think we will get our vaccines before traveling to Africa, so she asked our friend to strongly encourage it. Ha! I'm mot really sure why she doesn't think we will get vaccines, but it might have something to do with a conversation we had during our home study about not liking to use antibiotics or being wannabe rebels in general. No worries everyone, we don't mess around with yellow fever and meningitis. We will definitely be getting vaccinated! On another adoption note: Congratulations to our friends, the Brittons, on bringing their adorable little girl home from Ethiopia and to our other friends, the Blaines, on meeting their sweet little son in Ethiopia this past weekend. SOO much adoption excitement, so much joy added to these families!! In other news: We're on vacation, and I was all ready to do my What's happening Wednesday post yesterday until I discovered that it was only Tuesday. THAT is the beauty of vacation. 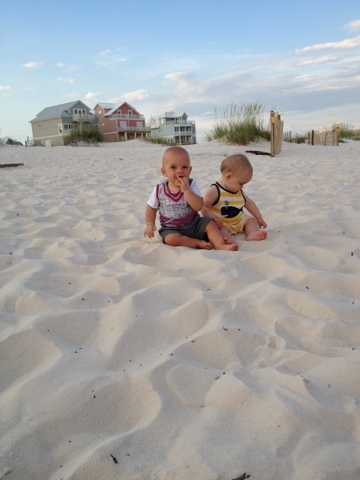 We are staying right on the beach in Gulf Shores with some of Brad's extended family, and the boys are loving it. (Let's be honest, I'm loving it, too, and I have a decent sunburn to prove it.) 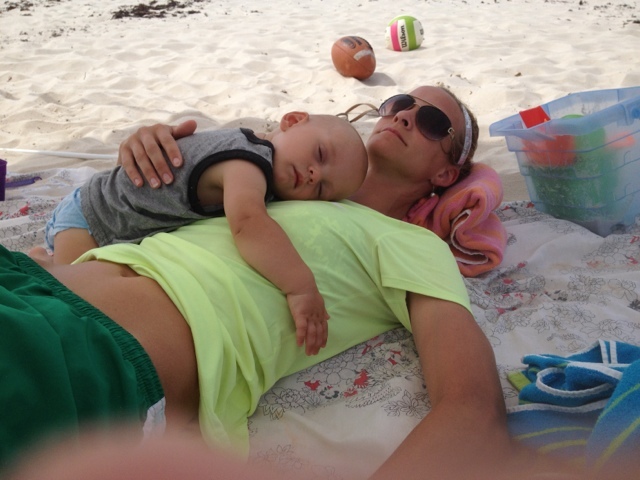 I had some concerns that Brecken would either hate the sand or eat 10 cups of it, and a it turns out one of my concerns was warranted. We've had some interesting diapers. I wish I had a video of Brody's first time at the beach, but it was after a LONG road trip full of bumper-to-bumper traffic near the end, and since it looked--and smelled a little--like Wal-Mart threw up their snack section in our car I had a hard time finding my phone to capture some video. 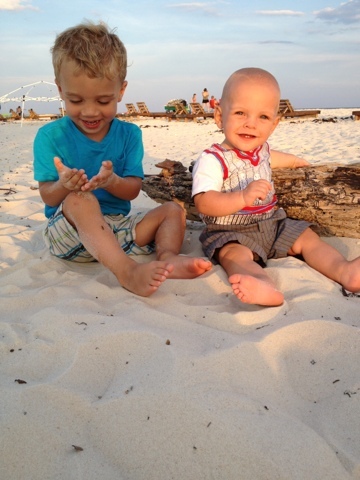 Anyway, we got right out of the car and headed straight to the beach with the boys. Brody kept pointing and yelling "beach!" and when we hit the sand he didn't even know what he wanted to focus on first: White sand to feel, water to see, beach balls to find! He stopped to feel the sand with his feet first, then we went on out closer to the water where he flopped on the ground a bit to feel the sand all over. Rolled around a little, got up, flopped back down. Then he made some sand angels. He was experiencing an overload of awesome. He wasn't as sure how he felt about the water, but he enjoyed a quick feel with his feet. We got up and walked back to the car to unpack, and Brody gave the beach one last BEARHUG. Yes, he fell to his belly with arms stretched out and head on the sand as if he were hugging God--or at least someone 27 times his own size. What about Brecken? He likes the sand, but he's not a huge fan of the ocean water: too "cold" and unpredictable. His sweet spot is the pool, where the water is bath-water warm (which I am a fan of) and he has some room to crawl around in water that is about six inches deep. He loves baths, so this spot is perfect for him. He pulls himself up near the edge, then falls backward into the water. Stands, falls, stands, falls...All day long. Then he crawls and splashes. If we swim around in the water with him, he splashes and kicks his feet like a frog jumping out of water. He is a crazy little dude. These boys are L-I-V-I-N' the dream, and so am I.